The Manuguru geothermal area, located in the Telangana state, is one of the least explored geothermal fields in India. In this study, characterization of the soil samples is carried out by laser-induced breakdown spectroscopy (LIBS) coupled with analytical spectral-dependent principal component analysis. A total of 20 soil samples were collected both from near the thermal discharges as well as away from the thermal manifestations. LIBS spectra were recorded for all the collected soil samples and principal component analysis (PCA) was applied to easily identify the emission lines majorly responsible for variety classification of the soil samples. In this submission, a modified PCA was developed which is based on the spectral truncation method to reduce the huge number of spectral data obtained from LIBS. The PCA bi-plot on the LIBS data reveals the presence of two different clusters. One cluster represents the soil samples collected from the close vicinity of the thermal manifestations whereas the other cluster contains the soil samples collected away from the thermal sprouts. PCA performed on the chemical dataset of the soil samples also reveals the same clustering of the soil samples. 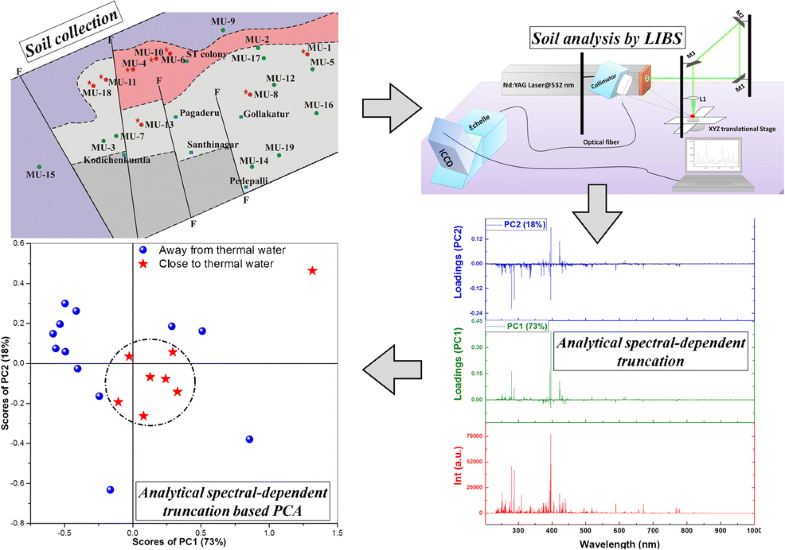 Both LIBS and chemical analysis data shows that soil samples near the thermal waters are found to be enriched in B, Sr, Cs, Rb, Fe, Co, Al, Si, Ti, Ru, Mn, Mg, Cu, and Eu concentrations compared to the soil samples located away from thermal manifestations. This study demonstrates the potential use of LIBS coupled with PCA as a tool for variety discrimination of soil samples in a geothermal area. LIBS is shown to be a viable real-time elemental characterization technology for these samples, avoiding the rigorous dissolution required by other analytical techniques. The authors (SC and UKS) wish to acknowledge Dr. P.K. Pujari, AD, RC&I group and the officers of GSI for their help and encouragement during the study. The authors (MS and AS) are thankful to Dr. S. Kannan, Head, FCD, for their constant support and encouragement in the LIBS work. 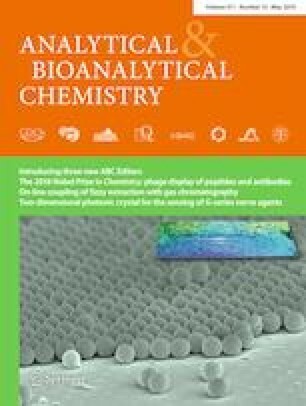 The authors greatly acknowledge the in-depth and insightful reviews of two anonymous reviewers which have immensely contributed to the improvement of the quality of the manuscript. Kumar A, Singhal RK, Rout S, Ravi PM. Spatial geochemical variation of major and trace elements in the marine sediments of Mumbai Harbor Bay. Environ Earth Sci. 2013. https://doi.org/10.1007/s12665-013-2366-3.